Hillary Clinton: Time to "end the era of mass incarceration"
Democratic presidential candidate Hillary Clinton spoke at length Wednesday about the recent unrest in Baltimore, addressing racial disparities in the criminal justice system, calling for an end to the "era of mass incarceration," and laying out a detailed vision for reform during a speech in New York City. Though Clinton's speech at the Dinkins Forum at Columbia University had been planned for months, it offered her a timely opportunity to comment on the volatile situation in Baltimore, which has been beset by protests and riots after the death of a young black man in police custody earlier this month. Freddie Gray, a 25 year old from the Gilmore Homes neighborhood of Baltimore, was detained by police officers on April 12 for possession of a switchblade. He was dragged into a police van and taken to the station. When he arrived 25 minutes later, he was in a coma, his spinal cord 80 percent severed from his neck. A week later, despite extensive surgery, he passed away. "Yet again, the family of a young black man is grieving a life cut short," Clinton said Wednesday. "Yet again, the streets of an American city are marred by violence, by shattered glass and shouts of anger and shows of force. Yet again, a community is reeling, its fault lines laid bare and its bonds of trust and respect frayed. Yet again, brave police officers have been attacked in the line of duty. What we have seen in Baltimore should, I think does, tear at our soul." 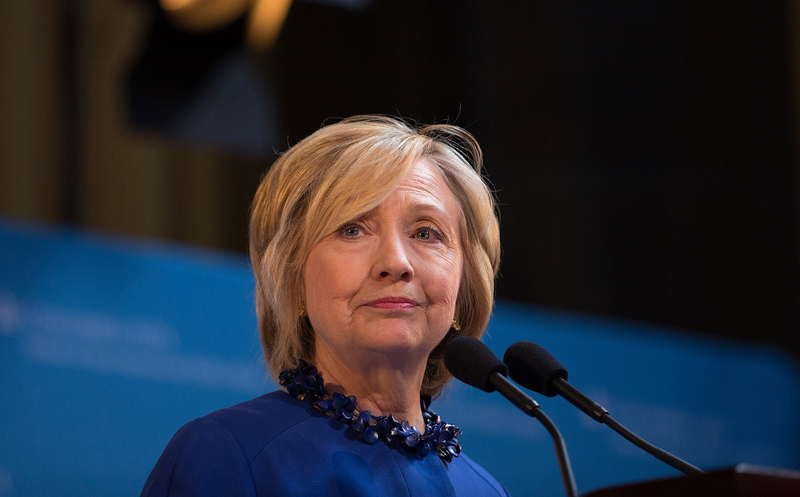 Clinton urged protesters to heed the "pleas of Freddie Gray's family for peace and unity." "Those who are instigating further violence in Baltimore are disrespecting the Gray family and the community," she said. "The violence has to stop." But the situation there is hardly unique, Clinton added, noting the heated protests that attended other recent police killings of young black men. "We have to come to terms with some hard truths about race and justice in America," Clinton said. "There is something profoundly wrong when African American men are still far more likely to be stopped and searched by police, charged with crimes, and sentenced to longer prison terms than are meted out to their white counterparts. There is something wrong when a third of all black men face the prospect of prison at some point during their lifetimes." "We have allowed our criminal justice system to get out of balance, and these recent tragedies should galvanize us to come together as a nation to find our balance again," she said. The speech marked Clinton's first detailed policy address since she announced her presidential bid earlier this month. In it, she offered proposals on prison and sentencing reform, probation and drug diversion programs. She called for increased support for mental health and drug treatment, and alternative punishments for lower-level offenses committed by young people. Are body cameras for officers worth the investment? Clinton noted that many police departments across the country have successfully established trust between officers and the community they serve, "demonstrating how we can protect the public without resorting to the use of excessive force." Going forward, she said, the U.S. should ensure "that federal funds for state and local law enforcement are used to bolster best practices rather than to buy weapons of war that have no place on our streets." Clinton also called for the use of police body cameras in every jurisdiction across the country. "That will improve transparency and accountability. It will help protect good people on both sides of the lens," she said. Beyond policing reforms, Clinton added, the U.S. needs to overhaul its approach to sentencing and incarceration. "One in every 28 children in our country now has a parent in prison," she said. "They're not there to look after their children or bring home a paycheck, and the consequences are profound. Without the mass incarceration that we currently practice, millions fewer people would be living in poverty." "We need a true national debate about how to reduce our prison population while keeping our communities safe," she added, calling for alternative sentences for low-level offenders and more probation and drug diversion programs. She was particularly emphatic on the need to overhaul the justice system's approach to mental health, warning that the current system - in which "our prisons and our jails are now our mental health institutions" - is flatly unacceptable. Taking a step back, Clinton warned that it's impossible to separate the problems with today's criminal justice system from more fundamental concerns about race, opportunity, and inequality. "I don't want the discussion about criminal justice, smart policing to be siloed...the conversation needs to be much broader, because that is a symptom, not a cause for what ails us today," she said. "We can't separate the unrest we see on our streets from the cycles of poverty and despair that hollow out those neighborhoods." The tone of the speech was particularly noteworthy for Clinton because her husband, former President Bill Clinton, embraced "tough-on-crime" policies during his presidency the 1990s. Clinton's address reflected a calculation that the pendulum has swung since her husband's tenure - that skyrocketing incarceration rates and falling crime rates have created the political space necessary for policymakers to rethink old approaches to crime and punishment. Clinton nodded at some recent bipartisan activity in Congress on the issue, commending Republicans like Kentucky's Rand Paul and Utah's Mike Lee for partnering with Democrats on issues like sentencing and prison reform. "There seems to be a growing bipartisan movement for common sense reforms in our criminal justice system," she said. "It is rare to see Democrats and Republicans agree on anything today. But we're beginning to agree on this."